First Unitarian’s Youth programming provides a well-rounded religious education to our youth. While the curriculum varies from year to year, our web of youth ministry balances pastoral care, spiritual development, beloved community, justice making, faith exploration, multi-generational relationships, covenantal leadership, and identity formation. Sunday Morning Programming – Every morning at 11 am the Mid-High Group meets to explore Unitarian Universalism, ethics, spiritual practices, and how a community functions. Coming of Age – Each spring we offer Coming of Age classes to our eighth graders as they prepare for high school. Students learn more about Unitarian Universalism and themselves as they prepare “This I Believe” statements and lead a service for the entire congregation. Our Whole Lives (OWL) – A nationally acclaimed, lifelong sexuality curriculum developed by the Unitarian Universalist Association in partnership with the United Church of Christ. Trained volunteers teach First Unitarian OWL classes with age-appropriate content for children and youth. Sunday Morning Programming – Adult youth advisers partner with youth to lead curricula that is relevant to youth and that touches each aspect of the web of youth ministry stated above. Youth Cons – Weekend long conferences/events designed for youth. 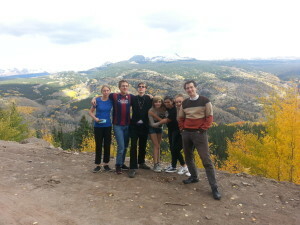 Youth from different UU churches in the Mountain Desert District join to worship, learn and to be together in fellowship. En route to a Youth Con in Colorado. Bridging Ceremony – Seniors in high school meet with Ministers and advisers to design a Sunday service that celebrates their entry into young adulthood. Service Learning Opportunities – Regular social action is not only a chance to serve the broader community but a chance to learn and reflect on those experiences. For more information, please refer to the Youth Programs Resource Manual. This manual includes: Youth Advisor Policy, Youth Program Coordinator, Child Protection Policies, and Overnight Policy.